Variety reports that Bradley Cooper has been tapped to play the best friend of Jim Carrey's character in the upcoming comedy - "Yes Man". Bradley Cooper played the villain in the hit comedy "Wedding Crashers" (2005) and appeared in the film "Failure to Launch" (2006). In 2005 he played the lead role in the Fox sitcom Kitchen Confidential. 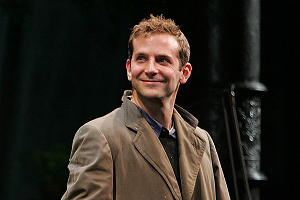 Last year Cooper starred in "Three Days of Rain" on Broadway with Julia Roberts and Paul Rudd at the Bernard B. Jacobs Theatre. "Yes Man" is scheduled to begin production this month, we are still awaiting the date. Thank you for the news!! I not know who's this actor....but it seems likeable him! "I won't quit til I'm a star, On broadway, on Broadway." Sorry, I had to break out in song for that one. I can't control it, whenever someone says 'Broadway'...ok so I can control it but I just don't feel like it sometimes. Cool, this guy's pretty high profile, should be good for PR.